ARLINGTON, Va. — Not a single small SUV out of 21 tested earns a good rating in the Insurance Institute for Highway Safety's headlight evaluations, and only four are available with acceptable-rated headlights. Among the 21 vehicles, there are 47 different headlight combinations available. More than two-thirds of them are rated poor, making this group of vehicles even more deficient when it comes to lighting than the midsize cars that were the first to be rated earlier this year. Headlight performance in today's vehicles varies widely. Government standards are based on laboratory tests, which don't accurately gauge performance in real-world driving. The issue merits attention because about half of traffic deaths occur either in the dark or around dawn or dusk. As with midsize cars, the IIHS evaluations of small SUVs showed that a vehicle's price tag doesn't correspond to the quality of headlights. More modern lighting types, including high-intensity discharge (HID) and LED lamps, and curve-adaptive systems, which swivel in the direction of steering, also are no guarantee of good performance. "Manufacturers aren't paying enough attention to the actual on-road performance of this basic equipment," says IIHS Senior Research Engineer Matthew Brumbelow. "We're optimistic that improvements will come quickly now that we've given automakers something to strive for." For 2017, vehicles will need good or acceptable headlights in order to qualify for the Institute's highest award, Top Safety Pick+. While studies have pointed to advantages for advanced lighting systems, the IIHS rating system doesn't favor one type of technology over the other. Instead, it simply measures the amount of usable light provided by low beams and high beams as vehicles travel on straightaways and curves. IIHS engineers evaluate headlights on the Vehicle Research Center's track after dark. A special device is used to measure how far the light is projected as the vehicle is driven on five approaches: traveling straight, a sharp left curve, a sharp right curve, a gradual left curve and a gradual right curve. Glare from low beams for oncoming drivers is also measured in each scenario. A vehicle with excessive glare on any of the approaches can't earn a rating higher than marginal. The only type of technology given an explicit nod in the ratings is high-beam assist, which automatically switches between high and low beams based on the presence of other vehicles. Vehicles can earn extra credit for this feature because of its potential to increase low rates of high-beam use. The best-performing headlights in the small SUV group belong to a new model, the Mazda CX-3, and are available on its Grand Touring trim. They are curve-adaptive LED lights with optional high beam assist. The low beams perform well on both right curves and fairly well on the straightaway and sharp left curve; however, they provide inadequate light on the gradual left curve. The high beams perform well on most approaches. The other vehicles available with acceptable headlights are the Ford Escape, the Honda CR-V and the Hyundai Tucson. None of the three are curve-adaptive, and only the Escape has high-beam assist. Still, all of them provide fair or good illumination in most scenarios. The worst headlights among the small SUVs belong to a different Honda — the new-for-2016 HR-V. The illumination provided by the HR-V's halogen low beams and high beams is inadequate on all four curves and on the straightaway. The HR-V is one of 12 small SUVs that can't be purchased with anything other than poor-rated headlights. For those vehicles available with higher-rated headlights, consumers need to make sure they're getting the right ones. For example, the Tucson's acceptable headlight combination is available on the SUV's Limited version, but the headlights on other trim levels of the Tucson earn a poor rating. Even the Limited, when equipped with curve-adaptive headlights, earns a poor rating because of excessive glare. Seventeen of the rated SUV headlight combinations have unacceptable glare. They include all types of lights — halogen, HID and LED — and none of the headlight types is more likely than the others to have excessive glare. Three of the 17 fell short of an acceptable rating on the basis of glare alone. "Glare issues are usually a result of poorly aimed headlights," Brumbelow says. "SUV headlights are mounted higher than car headlights, so they generally should be aimed lower. Instead, many of them are aimed higher than the car headlights we've tested so far." 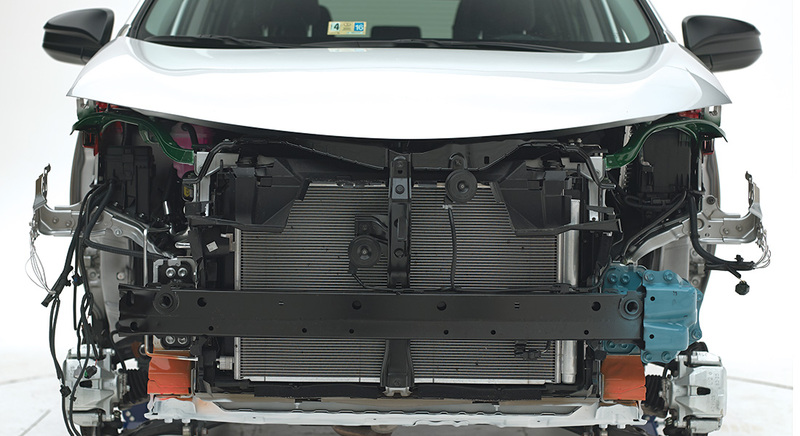 IIHS plans to conduct headlight tests on pickups next. The Airport Cooperative Research Program (ACRP) is seeking potential legal research topics for the Fiscal Year 2017 ACRP Legal Research Program. The closing date for submitting legal research topics is September 2, 2016. The preferred method for submitting an ACRP legal research topic is by using our online proposal form. The Vision 100-Century of Aviation Reauthorization Act established the ACRP. The ACRP is an applied, contract research program with the objective of developing near-term solutions to issues facing airport-operating agencies. The ACRP is sponsored by the Federal Aviation Administration (FAA) and managed by the National Academies of Sciences, Engineering, and Medicine, acting through the Transportation Research Board (TRB). The program is governed by the ACRP Oversight Committee (AOC), which is comprised of airport-industry representatives appointed by the Secretary of the U.S. Department of Transportation. ACRP undertakes research and other technical activities in response to the needs of airport operators on various airport issues involving administration, environment, legal, policy, planning, safety, human resources, design, construction, maintenance, and operations at airports. Legal topics are requested and may be submitted to ACRP by anyone. The ACRP Legal Research Program is a project within the ACRP that addresses issues associated with airport-related law and produces a series of ACRP Legal Research Digests intended to provide attorneys practicing airport law, and other appropriate airport professionals, with authoritative, well-researched, specific information that is limited in scope. The studies focus on legal issues and problems having national significance to the airport industry. The resulting digests provide airport-related legal research on a wide variety of legal topics. The topics received from this solicitation will form the basis for selection of the annual ACRP Legal Research Program. They are not proposals to conduct the research but are used to identify potential topics only. An oversight panel that governs the ACRP Legal Research Program will select topics for the fiscal year 2017 program. In preparation for this selection process, this solicitation for potential topics is being conducted. A suggested format for email submittal of a legal research topic is included in the solicitation memo. A legal research topic may either be submitted via FAX to (202) 334-2006 or by online proposal form. Drivers of vehicles with good small overlap front ratings from IIHS can expect to be protected well in a frontal crash involving the left corner of the vehicle. But how would the passengers sitting next to them fare in a right-side small overlap crash? 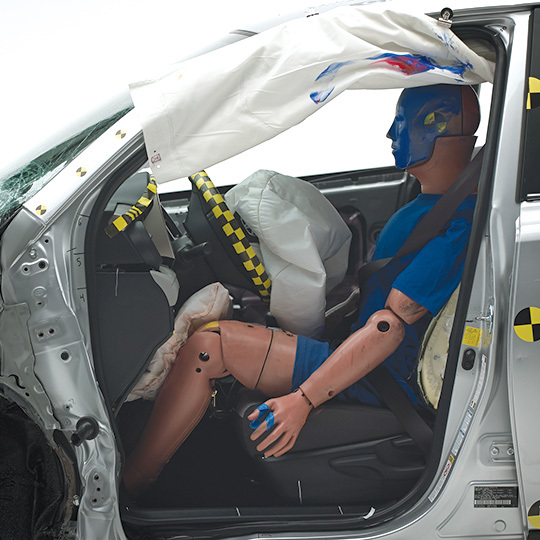 A new study shows that good protection doesn't always extend across the front seat. The Institute conducted 40 mph passenger-side small overlap tests on seven small SUVs with good driver-side small overlap ratings. Only one of the vehicles, the 2016 Hyundai Tucson, performed at a level corresponding to a good rating, and the others ran the gamut from poor to acceptable. 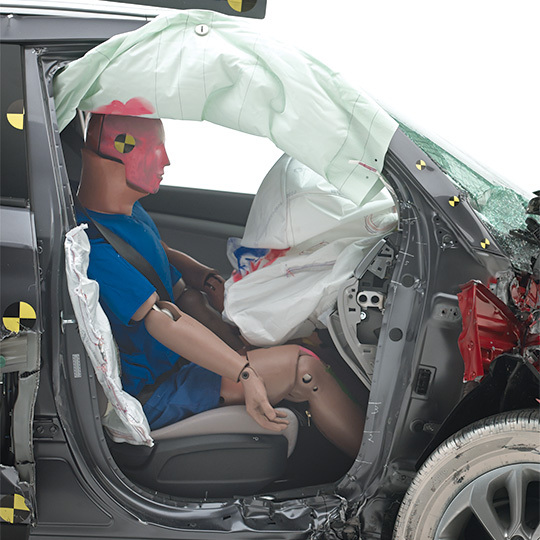 The results have prompted IIHS to consider instituting a passenger- side rating as part of its Top Safety Pick criteria. "This is an important aspect of occupant protection that needs more attention," says Becky Mueller, an IIHS senior research engineer and the lead author of the study. 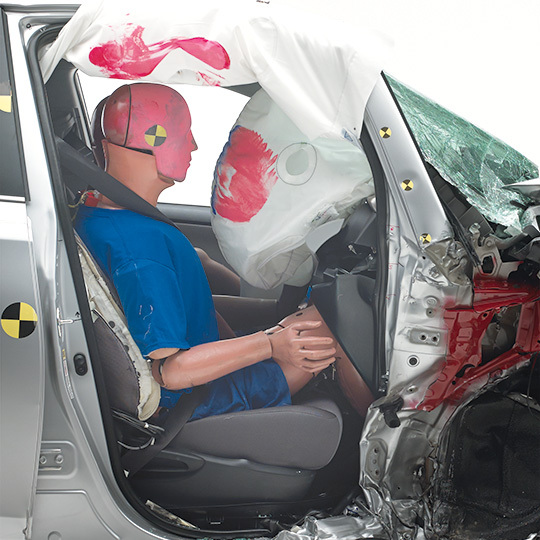 "More than 1,600 right-front passengers died in frontal crashes in 2014." This 2008 Mazda 3 went off a curvy two-lane road after dark in heavy rain and crashed into a tree. A 16-year-old girl was sitting in the front passenger seat. Her femur, tibia, jaw and nose were broken, and she was hospitalized for five days. While the moderate overlap test involves 40 percent of the width of the vehicle, the small overlap test involves just 25 percent. It is designed to replicate what happens when the front corner of a vehicle collides with another vehicle or an object like a tree or utility pole. Small overlap crashes pose a challenge because they bypass a typical vehicle's main front structure. Since the test was introduced, 13 manufacturers have made structural changes to 97 vehicles. Of these, nearly three-quarters earned a good rating after the changes. 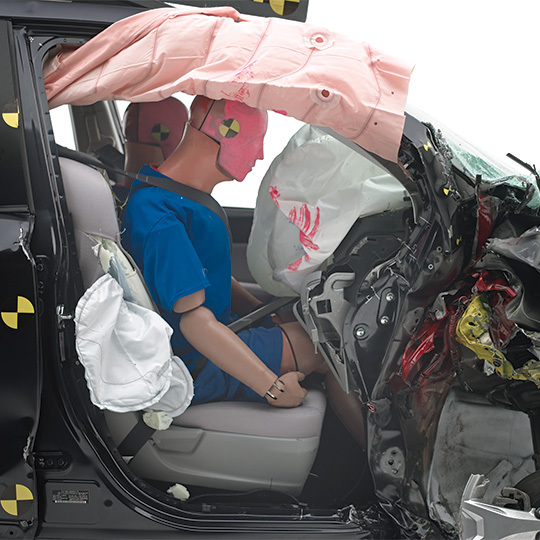 IIHS conducts its tests for frontal ratings with a driver dummy and with the barrier overlapping the driver side. The reason is simple: Every vehicle on the road has a driver, but there isn't always a passenger riding along. 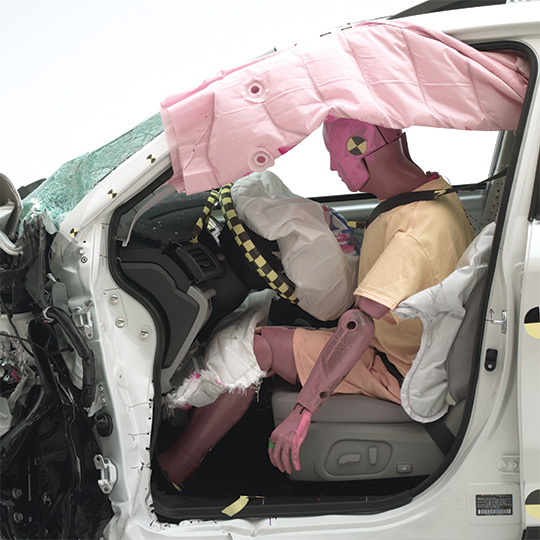 "It's not surprising that automakers would focus their initial efforts to improve small overlap protection on the side of the vehicle that we conduct the tests on," says David Zuby, IIHS executive vice president and chief research officer. "In fact, we encouraged them to do that in the short term if it meant they could quickly make driver-side improvements to more vehicles. As time goes by, though, we would hope they ensure similar levels of protection on both sides." The recent passenger-side tests show how big the differences can be. In this group of small SUVs, most didn't perform as well when they were crashed into a barrier on the right side instead of the left. That was even true of models that appeared symmetrical after removing bumper covers and other external components. "When structural improvements are visible only on the driver- side, there are large differences in performance," Mueller says. "But the inverse is not true. Some vehicle structures look the same on both sides, but they don't perform the same. That's why we can't rely on visual analysis but need to monitor this issue and possibly begin rating vehicles for passenger-side protection." The 2015 Toyota RAV4 and the 2014 Nissan Rogue were the only vehicles to appear asymmetrical. In the passenger-side test, the RAV4 was the worst performer. If the Institute issued ratings for passenger-side protection, the RAV4 would earn a poor rating. The Rogue would earn a marginal. These two vehicles had the highest amount of passenger-side intrusion. Intrusion measures are important because they indicate how well the structure held up; the greater the amount of intrusion, the higher the likelihood of serious injuries. Maximum intrusion in the passenger-side test was 13 inches more than in the driver-side test for the RAV4 and 10 inches more for the Rogue. The Rogue's door hinge pillar tore off completely, and the RAV4's door opened. In a real crash, an open door would leave the occupant at risk for ejection. Two vehicles that appeared symmetrical, the 2014 Subaru Forester and the 2015 Mazda CX-5, also had substantially more intrusion in the passenger-side test than in the driver-side test. 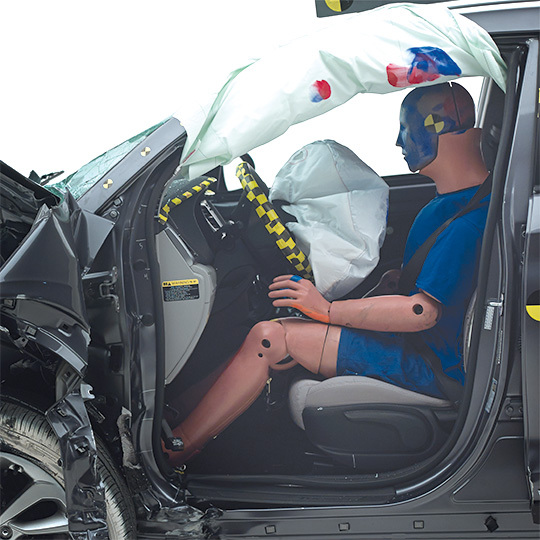 Earlier research by Mueller into how manufacturers improve vehicle structure for small overlap protection showed that the most common change is to strengthen the occupant compartment (see "How vehicles are changing for better small overlap protection," Dec. 23, 2014). To achieve this, manufacturers might use a different type of material or add a few millimeters of thickness — changes that can't be discerned from a visual examination. It's likely these types of modifications were made to the Forester and CX-5, but only on the driver side. The other three vehicles tested had relatively similar structural performance on both sides of the vehicle. The 2015 Buick Encore's structural performance was virtually identical on both sides of the vehicle, but it would receive an acceptable overall rating in the passenger-side test because the driver dummy's head slid between the driver and passenger front airbags, putting it at risk of hitting the dash. The Tucson would receive a good rating for passenger-side small overlap protection, though its structural rating would be acceptable instead of good, as it is in the driver-side test. The 2015 Honda CR-V also had slightly more intrusion on the passenger side than on the driver side and would receive an acceptable rating overall. The differences between driver-side and passenger-side performance in the Tucson and the CR-V are small enough that they could be a result of normal variability in test results. Another factor is that vehicles are to a certain extent inherently asymmetrical. For example, structures to secure the steering wheel and pedals may provide additional bracing around the driver-side toepan, which prevents some intrusion. That same toepan area on the passenger side without those structures is where the highest intrusion measures occurred on the passenger side of the CR-V and Tucson. 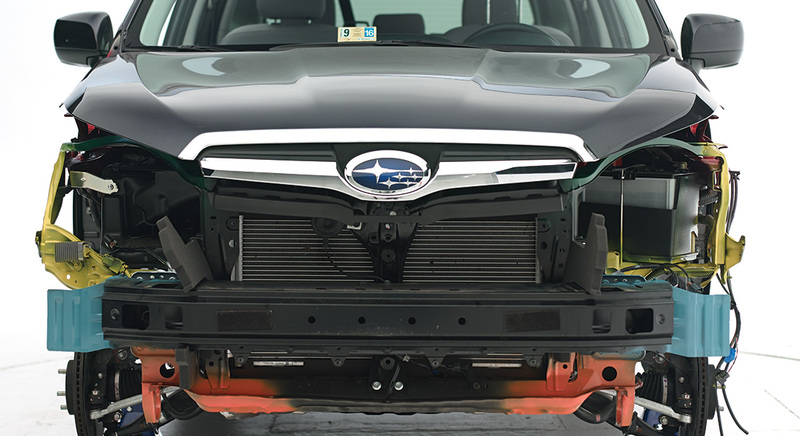 When engineers removed bumper covers of SUVs being tested for passenger-side small overlap protection, some had structural differences between the right and left sides. Others looked symmetrical but didn't always perform similarly. 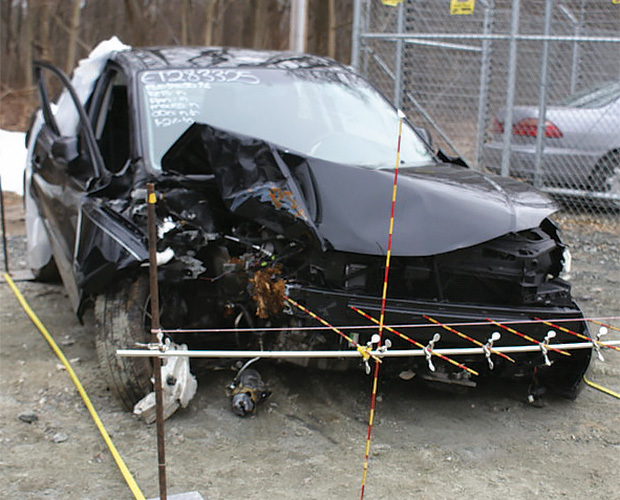 In addition to the seven passenger-side small overlap tests, Institute engineers conducted two passenger-side moderate overlap tests to make sure there weren't any differences in performance in that type of crash. One visually symmetrical vehicle, the CR-V, and one asymmetrical vehicle, the RAV4, were chosen for these tests. 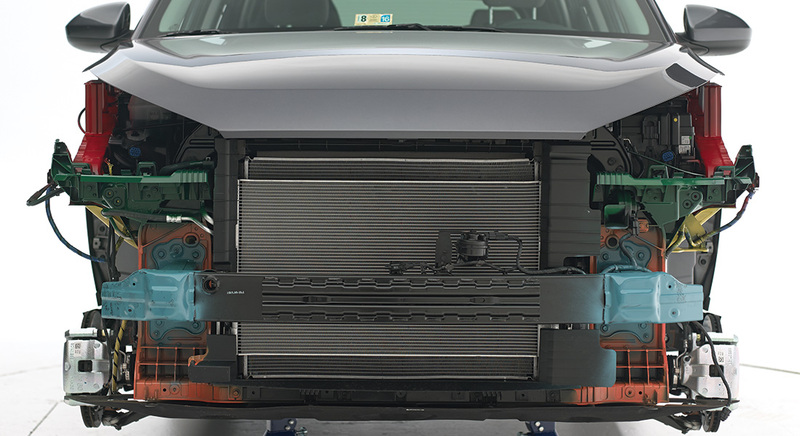 There was little difference from the driver-side moderate overlap tests, and both vehicles would receive a good passenger-side moderate overlap rating. "We conducted the moderate overlap tests as a spot check, and we weren't surprised that both vehicles performed well," Mueller says. "Many of today's models are designed for the global market and are subject to driver-side moderate overlap tests in right-hand-drive countries. With small overlap, there isn't the same incentive for symmetrical design because we're the only organization conducting the test." IIHS passenger-side small overlap ratings would remedy that situation. The Institute could start such a program next year and make it a requirement for one of its safety awards as early as 2018. The ACRP Oversight Committee, the governing board for the program, met on July 21, 2016, to review and select projects for the FY 2017 program. ACRP is soliciting nominees to serve on project-oversight panels for these new projects. A list and descriptions of the 16 projects that were selected are available online for review. Each ACRP project is assigned to a panel of volunteers that provides technical guidance and counsel throughout the life of the project. The typical project panel consists of airport representatives, academicians, research specialists, consultants, airlines, and other industry practitioners. Self-nominations are welcome and are encouraged to be made using the ACRP Practitioner Portal. Please submit a personal statement of interest for each specific project and a current resume with your nomination.You may nominate yourself or someone else to participate on multiple projects, but it is better to be selective. Nominations will be accepted immediately but no later than September 21, 2016, so that the program can move forward in a timely manner. To ensure proper consideration, ACRP needs sufficient contact information for each nominee, including name, title, affiliation, address, email, telephone number, and most importantly, professional qualifications related to the particular project, such as is found on a resume. Each nominee is considered and evaluated as to his or her strength in a set of predetermined disciplines, which are unique for each project, and also classified according to type of employment (e.g., employed by an airport, academic or research institution, consulting firm, airline, or other industry organization) and relevance of perspective for the particular topic of the project. Gender, ethnicity, and geographic location are also objectively considered and balanced as each project topic-specific panel is formed. TRB and its Airport Cooperative Research Program (ACRP) recognize the value that diversity of experience, perspectives, and technical expertise add to the research results we produce. ACRP’s goal is to develop the best products possible–products that are objective and credible and that significantly advance the state of knowledge or practice. Our experience shows that these results are best attained with guidance from panels of subject-matter experts, who bring diverse perspectives and life experiences to bear on any given topic and who are able to gauge the effectiveness of proposed research approaches and to successfully monitor the research. ACRP will examine all nominations and may initiate contact to determine an individual's interest and availability in serving for a particular project. Additional information for ACRP project panel members is available online. ITS Benefits >> Deployment of special event signal timing plans has reduced queuing onto travel lanes of I-75 before events and reduced time for traffic to disperse after events to 90 minutes from 3 to 4 hours.